The ERC 6D module transmits up to 6 bi-directional serial data, over one singlemode or multimode optical fiber. One module can be set to be compatible with RS 232, RS 422 or RS 485 4 wire and 2 wire standards by selection of internal dip-switches. 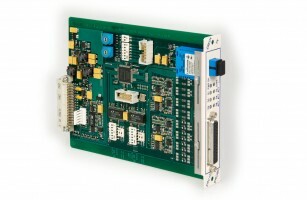 (*) RS 485 channels are fully separated to allow two different setting for the same module. LED display data activity of each signal, as the power and optical synchronization. The module is HOT SWAP and can be plugged in the 19″ 3U rack mounted chassis, the ERC 17-001, including Web browser or SNMP supervising (ERC 17 GUARD module). The stand alone box, the ERC 17 SA, can power one module ERC 6D.